(Newser) – At a meeting of major Republican donors, Chris Christie took a firm stand on domestic surveillance—and it's not sitting well with Peggy Noonan. Christie called the debate over the extent of government snooping "esoteric" and "intellectual," slamming the "strain of libertarianism that's going through both parties right now." He added: "I want them to come to New Jersey and sit across from the widows and the orphans and have that conversation." But worries about the issue are "very American," not to mention conservative, Noonan writes in the Wall Street Journal. Christie Cream, your a embarrassment to the GOP party, go away you trader!! He's not a conservative, period. I am shocked at those of you who criticize Governor Christie. He is a heavy thinker and his opinions should carry a lot of weight with all of us. I rank him high on a scale of 1 to 10 -- even higher on a scale of 1 to 350. The GOP should nominate him for president, because he will pound Clinton, Biden or whoever the DEMS nominate. 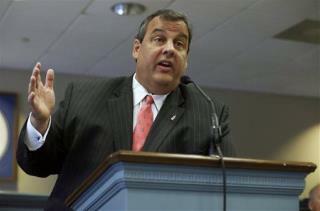 Christie boar with the state of New Jersey through all of its difficulties and he cut the fat from the budget. He'll govern well in WashingTON. I know that it sometimes seems like Christie is trying to hog all of the attention of the press, but please bear with him. He speaks to the common man -- in a round about manner. He knows the constitution stone cold.